MOUNT GILEAD — Jessica and Alex Scott braved 20-degree weather to get a taste of what life is like for the homeless. 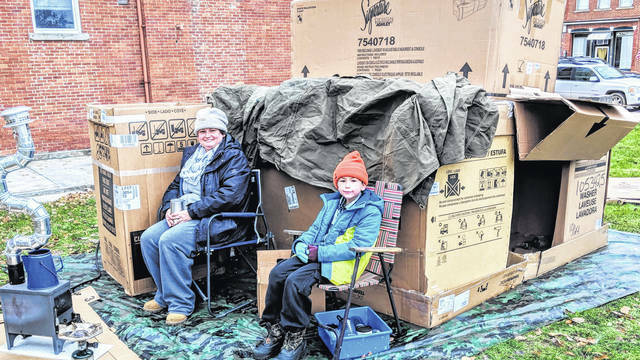 They spent the first part of the evening last Saturday standing in Shack City, on the corner of the Mount Gilead square, asking for donations for United Way. Jessica said she and her son could tell just by looking at people if they would give. “Some people stare, and then look away. You know they won’t give when they look away,” said Jessica who is an employee of Seniors on Center, a United Way agency. The Scotts said they were beginning to see how it felt to be dismissed and feel humiliated. They could see it must be degrading for homeless people when they have to ask for help. They were two of the 11 who registered to camp out on the Mount Gilead square as part of a United Way project to raise awareness about the problems of homeless people. Morrow County United Way Director Jodi Hayes said that $580 was raised by donations and sponsors for the event. The funds will go for help and needed supplies for the homeless in Morrow County. Hayes said it was an eventful evening with much awareness raised of the homeless situation despite the cold weather. Participants built shacks with cardboard boxes and saw the movie, ‘The Pursuit of Happiness’ about a true story of a homeless family. The United Way board is planning next year’s Shack City in October.